I’m finally making good on a longstanding intention to write a blog post about the role of the Yesander. What, you ask, is a Yesander? I will tell you. 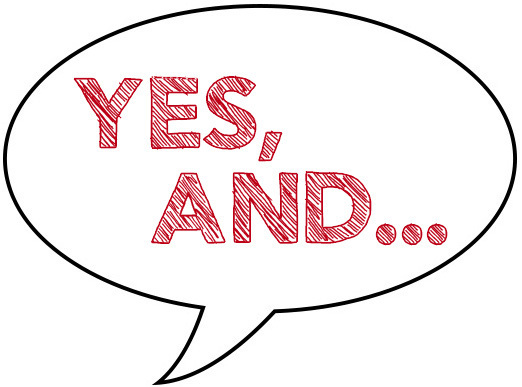 A Yesander is a person who follows the cardinal rule of improv: “Yes, and…”. In other words, someone who takes what’s offered, accepts it as it is, and then builds on it. In improv, Yes-and is critical to a scene’s success, because if one person refuses or blocks the other person’s offer, the scene dies on the vine. There’s nowhere for it to go. So all offers must be accepted and then built on; only then can the scene move forward. The build doesn’t have to be in the direction intended by the offerer. Indeed, much of the delight of improv comes from unexpected turns taken by the Yesander. 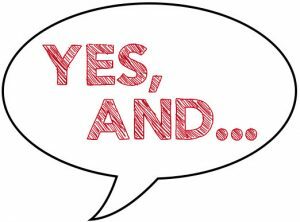 But at base, the interaction always rests on an acceptance of what’s offered (“Yes!”), and a building on that offer in some way (“…and…”). The opposite of the Yesander is the Yesbutter. Our world, our workplaces, our political arenas are full of Yesbutters. The Yesbutter is one who hears an idea, appears to accept it – and then immediately blocks it by finding reasons why it won’t work. “Yes, great idea…BUT…we don’t have the funds to implement it…our people will never go for it…it’s too complicated…the time isn’t right…” Bam: you’re dead. Scene over. It’s not that the Yesander ignores the potential difficulties. She may even think (or know!) that the idea is unworkable – or just plain wrong-headed. But she accepts the offer as given, looks for what she can work with, and finds a way to move the scene forward. Maybe in quite a different direction than the Innovator intended, but always coming out of what was offered, and thus grounded in the existing reality. In other words: authentic (to use a much overused word). The Yesander’s view is essentially optimistic, or at least hopeful. It operates out of the belief that there is always a way forward, though “forward” may look odd and circuitous to the outside observer. It’s also an open-minded stance that doesn’t have a fixed end-point in view. The Yesander says, “I’m going to take your idea as given; now let’s play with it and see where it goes.” It’s a playful and creative approach that opens the field to whatever emerges. I don’t see the Innovator and the Yesander as mutually exclusive. A person can be an Innovator in one instance and a Yesander in another. But I don’t think you can be both at the same time. When ideas are at stake, the Innovator-du-jour needs an external Yesander to play with. Someone who can provide a different, possibly even startling, perspective that the Innovator simply couldn’t come up with himself. I like being a Yesander. Enjoy my chatter? Enter your email address and you'll be notified whenever I post new stuff! Registration is open for our upcoming course! © 2019 Outside the lines. All Rights Reserved.